For the last decade in American politics, Hugo Chavez became a potent political weapon - within a few years of his ascent, he was transformed from just a leader of a neighboring nation into a boogeyman synonymous with extremism. Regularly invoked in over-the-top political rhetoric, Chavez's name became a decontextualized epithet to try to attach to a political opponent so as to make that opponent look like a radical. Because of this, America barely flinched upon hearing the news that the Bush administration tried to orchestrate a coup against the democratically elected Venezuelan leader. Just to get it out of the way, I'll state the obvious: with respect to many policies, Chavez was no saint. He, for instance, amassed a troubling record when it came to protecting human rights and basic democratic freedoms (though as Mark Weisbrot of the Center for Economic and Policy notes, "Venezuela is recognized by many scholars to be more democratic than it was in the pre-Chávez era"). His rein also coincided with a boom in violent crime. That said, these serious problems, while certainly worthy of harsh criticism, were not the primary reason Chavez became the favorite effigy of American politicians and pundits. In an age marked by America's drone assaults, civil liberties abuses, and war on voting, it is not as if this nation's political establishment sees an assault on democratic freedoms as deplorable. Likewise, that same political establishment is more than friendly with leaders of countries like Mexico and Colombia - countries which are also periodically hotbeds of violent crime. No, Chavez became the bugaboo of American politics because his full-throated advocacy of socialism and redistributionism at once represented a fundamental critique of neoliberal economics, and also delivered some indisputably positive results. Indeed, as shown by some of the most significant indicators, Chavez racked up an economic record that a legacy-obsessed American president could only dream of achieving. 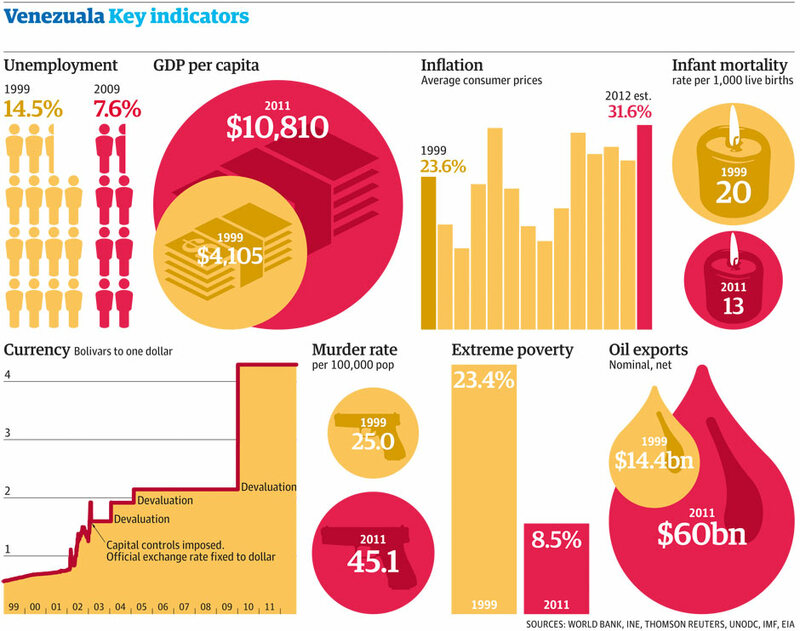 For instance, according to data compiled by the UK Guardian, Chavez's first decade in office saw Venezuelan GDP more than double and both infant mortality and unemployment almost halved. Then there is a remarkable graph from the World Bank that shows that under Chavez's brand of socialism, poverty in Venezuela plummeted (the Guardian reports that its "extreme poverty" rate fell from 23.4 percent in 1999 to 8.5 percent just a decade later). In all, that left the country with the third lowest poverty rate in Latin America. Additionally, as Weisbrot points out, "college enrollment has more than doubled, millions of people have access to health care for the first time and the number of people eligible for public pensions has quadrupled." When a country goes socialist and it craters, it is laughed off as a harmless and forgettable cautionary tale about the perils of command economics. When, by contrast, a country goes socialist and its economy does what Venezuela's did, it is not perceived to be a laughing matter - and it is not so easy to write off or to ignore. It suddenly looks like a threat to the corporate capitalism, especially when said country has valuable oil resources that global powerhouses like the United States rely on. That, of course, is considered a high crime by the American political illuminati - a high crime prompting a special punishment. As evidenced by the treatment of everyone from Martin Luther King to Michael Moore to Oliver Stone to anyone else who dares question neoliberalism and economic imperialism, that punishment is all about marginalization - the kind that avoids engaging on substance for fear of allowing the notion of socialism to even enter the conversation in the first place. Instead, the non-conformist is attacked and discredited with vapid invective and caricature, becoming a cartoon villain whose ideas, performance and record are ignored before they can be considered on the merits. He becomes, in other words, the Hugo Chavez we so often saw in American political ads. Stating this, mind you, is not to claim that Venezuela's economy under Chavez was perfect. As The Week correctly put it, while "Chavez's policies of redistribution and nationalization of oil assets endeared him to Venezuela's working class" and produced many laudable results, the country's "oil-centric economy has taken away resources from other areas that are badly in need of development." However, it is to argue that at a moment when America faces a pivotal debate about taxation and the size of government in specific and free market fundamentalism in general, Chavez's passing should prompt as much reflection on the individual iconoclast as on the overarching economic ideas he came to embody. To start, that means asking important questions. For example, the United States has adamantly rejected the concept of nationalization and instead pursued a bailout/subsidy strategy when it comes to rapacious banks and oil companies - and those firms have often gone on to wreak economic havoc. Are there any lessons to be learned from Venezuela's decision to avoid that subsidization route and instead pursue full-on nationalization? Likewise, in a United States whose poverty rate is skyrocketing, are there any lessons to be learned from Venezuela's policies that so rapidly reduced poverty? And in a United States that has become more unequal than many Latin American nations, are there any constructive lessons to be learned from Chavez's grand experiment with more aggressive redistribution? No doubt, there are few absolutely clear answers to those uncomfortable questions, if those questions are assessed honestly. Most likely, in fact, the answers are murky. But such questions need to be asked. The problem is that even gently raising them typically gets one tarred and feathered as a communist and then inevitably called a Hugo Chavez pal (even if Chavez's overall record is also being criticized!). At the moment Chavez's name is invoked, the conversation is inevitably terminated, ending any possibility of discourse. That is by design - it is what the longtime caricaturing and marginalizing of Chavez was always supposed to do. But maybe now that the iconoclast is dead, the cartoon will end. Maybe now Chavez's easily ridiculed bombast can no longer be used to distract from Venezuela's record - and, thus, a more constructive, honest and critical economic conversation can finally begin.